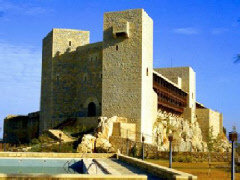 Extensively restored and extended to create the parador accommodation itself in 1968, this imposing fortress was created by Ferdinand III on the site of an earlier Moorish castle. Perhaps one of the most fascinating historical aspects, however, is that local legend maintains that the Parador de Jaen actually stands on the site of “Hannibal’s Tower”. It was here, some suggest, that Hannibal temporarily stopped on his way to conquer Rome, elephants and all. Since opening as a hotel, the building has welcomed guests from all across the world, including Charles de Gaulle. Four-star rated, it offers an outdoor swimming pool and 45 guest rooms in all. Granada and Cordova are both within reasonable driving distance.